We specialise in the design and manufacture of surface roughness specimens of all types. 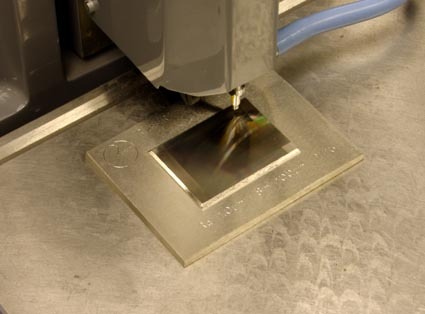 Working together with major instrument manufacturers, national measurement laboratories and also as a partner in an EU-funded project developing reference specimens for nanotechnology, we have unrivalled experience in the design and manufacture of precision reference standards for surface finish metrology. 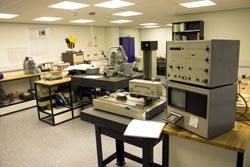 We also provide a measurement and calibration service for surface roughness in our standards laboratory. 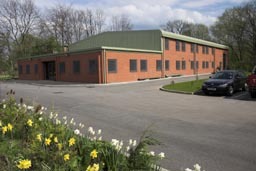 Our company was founded in 1941 and began manufacturing electrical tools and equipment, branching out into mechanical engineering during the 1950s with the manufacture of cast-iron and granite surface plates. In the late 1950s we delivered to the UK Air Ministry research laboratory at Feltham what was at that time the world’s largest surface table with a length of 70 ft. In the early 1960s we began to produce our first roughness comparison specimens. 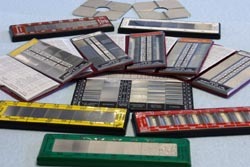 Initially these were individually machined and individually checked blocks of steel, but they gradually gave way to specimens electroformed in nickel, at lower cost and with much better quality control. In the 1980s we introduced our first precision roughness standards to be used for calibrating and checking roughness measuring instruments; and since then our range of specimens has expanded steadily to become the world’s largest range of different surface specimens offered by a single manufacturer. 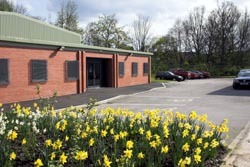 In order to improve our manufacturing processes so as to be able to produce surface specimens with very fine features, and with good accuracy, we have built a brand new factory on our site in Cheadle, set in beautiful countryside. 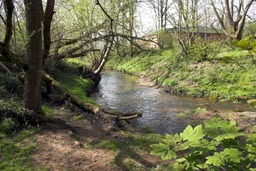 This was occupied in March 2003.